Did a Sonar Image Finally Find Amelia Earhart's Plane? It's been 76 years since Amelia Earhart disappeared and we're still trying to find her. Last year, a search team re-evaluated their findings and thought they might have discovered her wreckage. The same group has discovered more evidence on where her plane landed, citing the sonar image above. Have we found her at last? 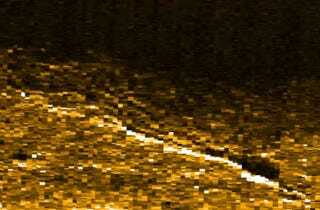 According to TIGHAR researchers, the sonar image shows a strong return from a narrow object roughly 22 feet long oriented southwest/northeast on the slope near the base of an underwater cliff. Shadows indicate that the object is higher on the southwest (downhill side). A lesser return extends northeastward for about 131 feet. The anomaly is described as being "definitely not a rock" and shows "drag markings" meaning it hasn't reached its final resting place just yet (meaning it hasn't always been there). Even better, the anomaly in the sonar image seems to be the right size and shape of Earhart's Electra plane and fits with the debris field picture we saw last year. Ric Gillespie, executive director of TIGHAR, says that the evidence they have found suggests that Earhart made a safe landing on the dry reef and sent distressed signals but never heard back, eventually living life as a castaway. TIGHAR theorizes that's because her plane was knocked off its landing gear on the reef and pushed into the ocean by waves before Navy search planes came to find her. The landing gear of Earhart's plane eventually sunk into the water too (as spotted by last year's debris field picture) and then the fuselage of the plane settled into the location of the anomaly as seen in the sonar image.